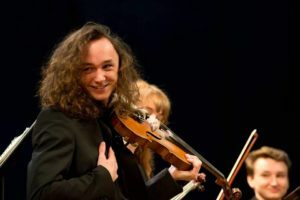 Tomás Pujol Owens is in his third year of the Music Performance degree at DIT, studying violin. He has played in multiple orchestral projects, such as the Hibernian Orchestra, Fishamble Orchestra, and Esker festival Orchestra, as well as playing in international Orchestras in Denmark and Spain. Frequently performing in chamber groups that have brought him to Budapest in the past year, as well as winning the Elsnor cup with Aoife Moran at the Feis Ceoil this year. During transition year, he travelled to Denmark for a year to study in the classical music boarding school Orkesterefterskolen, and returns to Denmark frequently to perform in the orchestra workshop Askov.